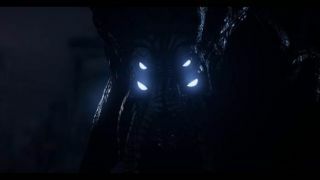 Turtle Rock Studios unveiled an all-new Evolve gameplay trailer at Microsoft's E3 presser, complete with a never-before-seen glowing-eyed electro-squid monster that could have come straight out the Lovecraft mythos. The Evolve trailer that made its debut at E3 earlier today didn't show off much we haven't already seen: four characters, four classes – Assault, Trapper, Medic and Support – hunting down a monster. Oh, yes, the monster: I'm pretty sure that's new. It's basically a cross between a Xenomorph, a robotic squid and a flying elephant that tosses around some kind of space-lightning for good measure. That could be a bit of a problem for our daring team of Squido-morph-ephant hunters. Not much else to see or say, except that according to the little blurb thing at the bottom of the screen, there will be both a beta test and DLC, but they'll both be exclusive and/or first, as the case may be, for the Xbox One. Not surprising, perhaps, but still disappointing.